Lock in a great price for A Casa da Cascata – rated 9.6 by recent guests! It was one of the best travelling experiences for my partner and I, accommodation-wise. The design and attention to details of the place are extraordinary, the colours are beautiful, everything is and feels so well-organised! Congratulations to the owners and to the staff for thinking outside the box! The view, the location and the little details all around the house that made our stay even more special. Loved the decor. Very tastefully renovated and decorated house. Kitchen was clean and modern. Also had some lovely old fashioned bits like the window shutters which keep out light and a stone washing tub do do hand washing. Loved the quirky light switches. The shower room is very modern. Great dressing gowns and towels. Liked the extra touch of the yellow towels for the thermals. Comfortable bed. Very clean. Charming architecture. The room was amazing. 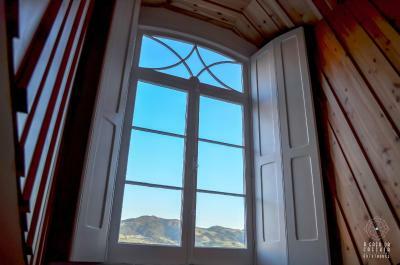 I had the bed in front of a massive window, with some staircases to sit close to the light and read my book. I was very happy staying there. The bed was comfy, it was extremely quite. However the appartment is very central. Parking was easy and for free. The hosts were friendly. Everything is very organised and clean. Very clean and comfortable throughout the location. Street parking very close. Kitchen and room (we had the double bunkbeds) well decorated and contained everything we needed. The beds were comfortable and the room had a heater. Bathroom was very modern. Facilities are very great, shared rooms are very neat and clean. 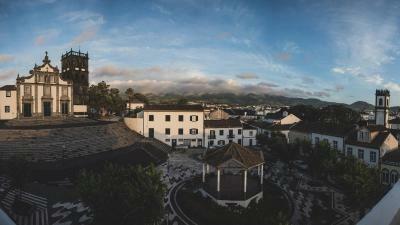 We had the room with the balcony and really liked the view of the main square and mountains in the background. Kitchen was well supplied with equipment and coffee/tea were available. The location was very good for walking to restaurants and seeing the historic area. Casa da Cascata is located in São Miguel Island's Ribeira Grande. Free WiFi access is available in this unit. The unit features accommodations in rooms, dormitories and also has the option of booking the entire house. Most rooms have access to shared bathroom facilities. The communal lounge will provide you with a TV and cable channels. There is a full communal kitchen with a microwave and an oven. Extras include a barbecue and an outdoor seating area. Local restaurants are available at a 10-minute drive. Other facilities offered at the property include a games room and laundry facilities. The property offers free parking. The Ponta Delgada center is 14 mi away, while the Joao Paulo II Airport is within 14 mi. 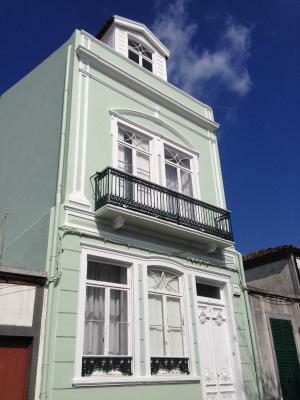 This property also has one of the top-rated locations in Ribeira Grande! Guests are happier about it compared to other properties in the area. This property is also rated for the best value in Ribeira Grande! Guests are getting more for their money when compared to other properties in this city. 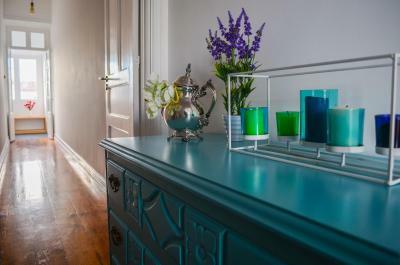 When would you like to stay at A Casa da Cascata? This double room has a balcony and access to shared bathroom facilities. This double room features private bathroom. This double room features access to shared bathroom facilities. This family room features a private bathroom. This room features a bunk bed and single bed, and access to shared bathroom facilities. House Rules A Casa da Cascata takes special requests – add in the next step! The on street parking was sometimes hard to obtain, but it is the historic part of town! Our room was very unique, in the attic with a mountain view.The location was perfect, in a quiet but central area, with access to small shopping facilities nearby. The staff was always available and very helpful. Definetly recommend. Everything was perfect. Great place to stay for a few days. Not in the main city, but only 10 minute drive from the main city. Little bit noisy. But nothing too bad. Everything is sparkling clean, including the bathroom, the bedroom, the kitchen and the common areas. Very tasteful interior design. Well equipped kitchen. Staff is nice and always available. They gave us a bathrobe and an extra towel for outdoor use on the island. The location is perfect, it's on a historic square of Ribeira Grande, which is a great strategic spot if you want to discover the whole island, being situated in the middle of it. This accommodation is awesome. The room is perfectly clean and comfortable. The common areas like kitchen and bathroom are always clean and well equipped. The hosts are really caring, they have great tipps and the communication is great. We really loved our stay here. I cannot explain how great this accomodiation is. The appartment is in really beautiful location, house is also very nice and in the house you can find everything what you want. Thank you. Casa da Cascata it’s a very charming place to stay in São Miguel. It was magical to wake up with the church bells on Sunday. The house has really nice views, it’s clean and the perfect blend between a hotel and a traditional home. Ribeira Grande has good connections to the main roads. I will definitely stay again when visiting the island. We just loved everything about the house! The atmosphere and all the small details are just amazing! I wish we would have a bedroom looking like the room we had! 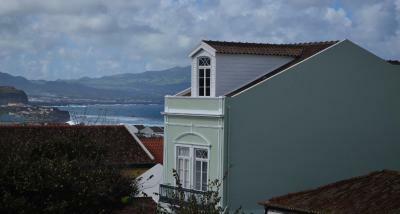 The location is just perfect in the center of Ribeira Grande. We would definitely come back again! Might be a little bit noisy at night but you can't have both a perfect location in the inner city and absolute silence. We absolutely enjoyed our stay. Fully equipped kitchen. We were very glad to have stayed at Casa das Cascata. The staff was very pleasant, we had a great stay and we met lovely couples that were also traveling. 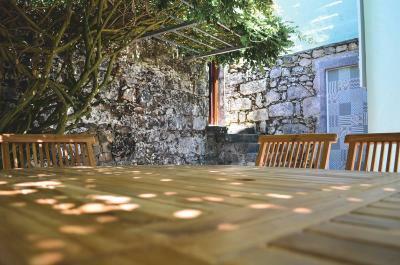 We appreciated the cleanliness of the place, the garden outside, the kitchen and how central it was in Ribeira Grande. Many thanks for a great stay! We've been super good at casa da cascata. Our room was a double super cute and spacious room, with a nice balcony with views to ribeira grande main square. We shared bathroom with other guests and it was always very very clean. All the house is decored with a really good taste, you can feel there like home. The kitchen and terrace are perfect to have your own breakfast and even cook if you feel like to. We totally recommend it! !